Monarch Air Group provides private air charter in Santa Barbara, CA. Our clients benefit from top-notch service, unrelenting dedication to safety, wide selection of aircraft, and years of experience in chartering private jets. To obtain a free quote, please use our online quoting tool provided below, or call toll free 1-877-281-3051. Monarch Air Group provides private jet charter flights in and out of Santa Barbara, California, USA. 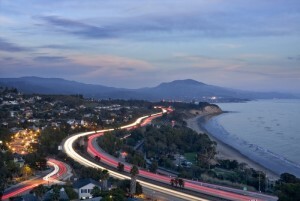 Situated against the Santa Ynez Mountains, Santa Barbara is a resort city in California, on the Pacific coast. Having natural beauty surroundings, warm year-round climate, Spanish architecture, and mountainous scenery, Santa Barbara welcomes tourists from all parts of the world. The downtown area has a beautiful blend of restored 19th century Mission Revival and adobes architecture. The most famous attractions are the Santa Barbara Bowl, the Santa Barbara County Courthouse, Casa de la Guerra, the Granada Theater, the Arlington Theater, the Lobero Theater, and the El Paseo Theatre. Stearns Wharf, the oldest operating wharf on the West Coast, is a home to fine restaurants, exhibits and shops. Nicknamed “American Riviera”, Santa Barbara has many exotic plants and palm trees line along the streets. Santa Barbara hosts many annual festivals and cultural events including the Fiesta, the Santa Barbara Arts and Crafts Show, the Summer Solstice Parade, and the Santa Barbara International Film Festival.